We’d love your help. 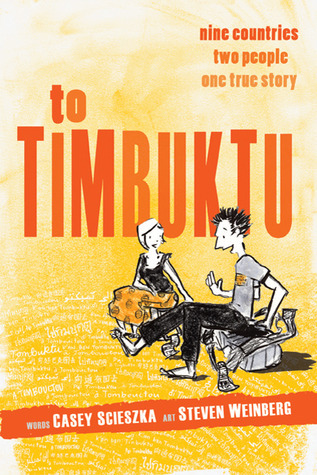 Let us know what’s wrong with this preview of To Timbuktu by Steven Weinberg. To ask other readers questions about To Timbuktu, please sign up. Casey and Steven were college students at opposite ends of the country, one in California and one in Maine. Yet, they happened to meet in Morocco during a study abroad trip. And they decided to keep in touch...and then they decided to move to China and teach English and then head out across the world together. Crazy where the world and life takes you huh? While traveling they fall in love with each other even more, find out about life and the world, and maybe make a few friends along the way (ev Casey and Steven were college students at opposite ends of the country, one in California and one in Maine. Yet, they happened to meet in Morocco during a study abroad trip. And they decided to keep in touch...and then they decided to move to China and teach English and then head out across the world together. Crazy where the world and life takes you huh? While traveling they fall in love with each other even more, find out about life and the world, and maybe make a few friends along the way (even if they don't speak the local language.) Most importantly...they have fun. Casey and Steven have an amazing story. And yes you hear that all the time, but how often do you find two young people that know what they want to do, go out and do it, and make the world a better place? (OK maybe a few times, but still...) Casey and Steven let us in on their journey with Casey writing journal entries/travel monologues and Steven adding charcoal sketches to accompany the words and share with us pictures of themselves, sights they saw, or just the people they met. It's one of those books that you pick up and you start reading and then keep going to see what happens and find out where they headed too next. Casey and Steven make us feel like we're there with them, meeting the people that they are. Even better they inspire the reader with the right way to not only travel, but to look at the world around them with new eyes. Travel, romance and finding oneself are what makes this book irresistible. Casey and Steven met in Morocco, had a long distance relationship across the US, and then moved together to China and eventually Mali. This book celebrates taking leaps of faith with one another, experiencing life to the fullest, embracing different cultures, and just being entirely human in the process. Come spend a year with an engaging couple who teach, write, draw, and inspire. Scieszka’s writing is frank and inviting. Travel, romance and finding oneself are what makes this book irresistible. Casey and Steven met in Morocco, had a long distance relationship across the US, and then moved together to China and eventually Mali. This book celebrates taking leaps of faith with one another, experiencing life to the fullest, embracing different cultures, and just being entirely human in the process. Come spend a year with an engaging couple who teach, write, draw, and inspire. Scieszka’s writing is frank and inviting. She captures travel and the experience of other cultures with an honesty that is very refreshing. From the rush of a new country and its own unique culture to the isolation and boredom that sometimes result, there is no shrinking away from even the bowel-churning portions of travel. At the same time, she depicts a growing relationship with Weinberg that slowly deepens and naturally evolves. Weinberg’s illustrations are equally refreshing with their rough edges, free lines and widely smiling faces. As one turns the pages in the book, each new page is often a new story, a moment captured from their travels. The illustrations help make this work very well. Reading this would send me into memories of my own travels, thinking about times when I had felt the same or done something similar. If you are a traveler, this book will speak directly to you and your experiences. If you are hoping to become one, this book will inspire you to do it. The book features artwork by Steven Weinberg, but it is lost in this massive amount of text that clearly needs to be edited. When you add graphics to a novel, they need to support the text and become part of the book. But the text in this book is so overwhelming, just paragraphs and paragraphs of letters that you don't really even notice the art crammed to the side of it, which is a real shame. And the text flits around to the point of sometimes not knowing that you have switched countries.. or what you might want to know about the country is not included, or perhaps thing of interest to the writer just are not that interesting to a reader. I think this book is going to make me want to travel even worse but gotta love it! I loved reading the author's travels. So many times I heard myself agreeing and relating to their feelings when traveling. I wish I had written this book about my experiences in Indonesia. It was wonderful. It ached reading this - the good and the bad of living abroad rushed back at me. Casey and Steven are a young couple on an adventure. They met while studying abroad in college in Morocco and have embarked on a trip that takes them from Brooklyn to Beijing to Mali to Timbuktu. Along the way they meet loads of interesting people and have the experience of a lifetime. This is their journal/memoir/scrapbook. It's funny, scary, exasperating and grandly illustrated by Steven's pencil sketches. Their first stop to teach English in Beijing starts off a bit rough -- their assignment i Casey and Steven are a young couple on an adventure. They met while studying abroad in college in Morocco and have embarked on a trip that takes them from Brooklyn to Beijing to Mali to Timbuktu. Along the way they meet loads of interesting people and have the experience of a lifetime. This is their journal/memoir/scrapbook. It's funny, scary, exasperating and grandly illustrated by Steven's pencil sketches. Their first stop to teach English in Beijing starts off a bit rough -- their assignment isn't what they expected and teaching children from 5-15 in three different schools can be pretty challenging. But even that's not as difficult as interviewing Arab and African Muslims about Islam and education in Mali -- that's Casey's Fulbright research topic. Steven is an artist and spends most of his time sketching and painting. This book is basically a combination graphic novel/journal/travelogue/memoir of a new relationship. Any of those elements alone wouldn't have been enough to make me pick it up, but with all of them thrown together, I was too intrigued to resist. Essentially, a couple who met when they studied abroad and maintained a very long-distance (separate coasts) relationship for a year decided to spend two years together traveling through Asia and Africa. They documented the experience through writing (her This book is basically a combination graphic novel/journal/travelogue/memoir of a new relationship. Any of those elements alone wouldn't have been enough to make me pick it up, but with all of them thrown together, I was too intrigued to resist. I really enjoyed reading this, and the style of the book itself was refreshing. But there were draggy parts, and I'd have really liked to read Steven's point of view, too, at times. One of the things that really bothered me was how much there was privilege in what they were doing, and it was never addressed -- this bothered me in the beginning, and it bothered me moreso in the end when there was a lot of being depressed about being harassed for money. I'm not sure why this is marketed as YA sinc I really enjoyed reading this, and the style of the book itself was refreshing. But there were draggy parts, and I'd have really liked to read Steven's point of view, too, at times. One of the things that really bothered me was how much there was privilege in what they were doing, and it was never addressed -- this bothered me in the beginning, and it bothered me moreso in the end when there was a lot of being depressed about being harassed for money. I'm not sure why this is marketed as YA since I think a lot will be unrelatable to most high school kids (and it's not for middle school students). Casey and Steven's relationship is post-college, so it's really kind of beyond most high schoolers. I think college age and 20somethings (and older) will like this one. Casey's voice reminded me of my best friend a LOT, which was enjoyable. She's super honest and willing to touch on some subjects with honesty many wouldn't. I know a lot of people my age who'll dig this. I liked "visiting" places I know little or nothing about. This review is based on an advance copy. The blend of physical and personal journey narrative kept me riveted. I was mildly disappointed by the actual events in the Timbuktu section...I had been looking forward to that part for many pages, but that was, in fact, one of the less interesting parts of the book. The details in the sections on other parts of Africa, or their adventures as teachers in China, were so much richer that the Timbuktu section suffered by comparison. Overall, the interactions This review is based on an advance copy. The problem of this book isn't so much its text (too much of it, overwhelming the images; poor style) or the images (below average), but how unbelievably shallow and superficial all the observations are, lacking any kind of depth and curiosity. It's quite remarkable how the authors managed to reduce that amazing journey to an endless stream of "and then we did this, and then we did that". Pain to get through, but I learnt how to pronounce Laos. I want to do a more complete review on my blog; so more to come. Really enjoyable read. I found Casey's voice genuine, fun and appealing and I like her even though she doesn't like Harry Potter! (and I don't really care for the Stupids -- gasp!) Steven's drawings are equally appealing. A great travelogue -- definite teen appeal I think. I'd love a recipe for some of the dishes -- especially the Chinese eggplant. Do Casey and Steven do Skype visits??? A travelogue written by the daughter of Jon Scieszka and illustrated by her boyfriend, Steven. They travel together to China to teach English, visit several East Asian countries, study and live in Mali. It's heavily illustrated by Steven, and written as 1-3 page snapshots of their experiences. A leisurely read, but no less enjoyable for it. Kind of like reading somebody's study abroad (Goshen College SST) journal they are doing for 3 credits of Gen Ed. Kind of interesting, but kind of tiring reading about first-world problems of not being able to connect or make friends, being asked for money, etc. after visiting (or "living" as they call it) in places where lots of travelers/Peace Corps workers/volunteers pass through. But funny enough, Casey is obviously Jon Scieszka's daughter! There should be more jokes! One of the most engaging, honest, and fun travelogues I've ever read. Neat drawings on every page with smart, well-placed text, it was a joy to lose myself in this book. Also, I know a lot more about Timbuktu now. A really enjoyable story of two young people traveling the world, and finding themselves - and each other - as they seek to learn and do good in Asia and Africa. Steven's illustrations complement Casey's text well. This is just delightful. Casey is so open, so stream -of-consciousness, so utterly in the moment and yet thoughtful, and Steven's pictures form an evocative and often amusing counterpoint and commentary. They were wonderful companions to share their journey, with each other and with readers. Better at the start and got a little boring towards the end, but still pretty good. It's a fun read with cool illustrations. This travelogue/memoir could be a lot more interesting and insightful than it is. The narrative is more engaging once they get to Mali, but that is more than halfway into the book. Must-read for any young person interested in teaching English in China or traveling in Asia or Africa. Great book! An adventurous and relevant true story about recent college grads, in love, who want to travel the world and make art. The graphic novel illustrations are fun and collaborative. What could be better? More travel lit than YA. Cute. I was super excited about this book, and I'm sure it's great and all, but the tone is a little too manic and disjointed for me right now. This one was pretty good. I loved the combination of Steven's quirky and whimsical illustrations and Casey's account of the ups and downs of their travels and, for the most part, each complemented the other to make an exciting and authentic story. Like their sometimes bizarre travels, this book had its ups and downs, but overall it held my attention (and being about 500 pages, this is an incredible feat tbh and I'm awarding a star for that alone). My favorite part of this book was the fact that there were drawings on every page. The story lacked substance. I finished and wondered what the point of it was. I didn't get a sense of a journey. I don't know what they learned from the different places that they visited and people they met. It was just a book that said hey, we went here, we ate this, and we met a few people, and now we're glad to go home. I loved this book. It was almost like reading Diary Entries and now I want to go to Mekong for a River Party!